Enjoy the beauty and calmth of the winter when the snow makes everything quiet, and take the opportunity to enjoy all of the activities offered in summertime. During the Spring, enjoy the sound of all the wild birds at sea trying to find a mate and enjoy the scent of the wild flowers and the warm pine forests. You can rent a small boat and, before June, catch a lot of herrings. During September and October you can pick mushrooms such as the yellow chanterelles and berries such as the wild blueberry (August), or take a dip in the warm water in the sea. 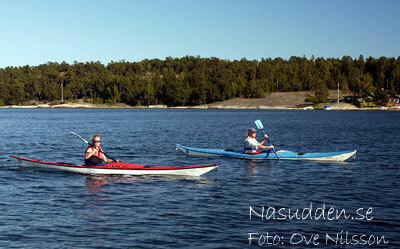 In the summer, Utö offers sandy beaches also suitable for small children. Experience the real Sweden and Utö by laying on stone cliffs warmed by the sun. These can be found around the island, including the southern island of Ålö and these offer excellent swimming opportunities. Close to Näsudden, there are some interesting geological findings such as giant holes in the cliffs from the Ice Age, created by ice, snow and water during a long period. 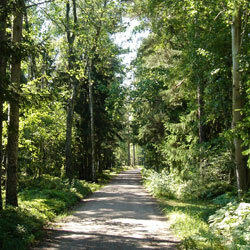 Further down the road you can take right and reach a larger sandy beach, Alléviken. If you just go straight ahead you have a choice of turning left to Pizzastugan where you can buy beverages, ice cream and meals, or turn right to visit Arnold’s collection of motor cycles and buy some nice gifts at Marianne’s Syskrinet. Open daily between 2 – 5 PM. If you rent a bicycle (we have bicycles, child seats and a bike wagon), you can reach some bigger sandy beaches. While riding your bike, enjoy the scent and beauty of the wild flowers and warm pine forest and listen to the birds singing of joy. What could be more relaxing! We also rent out two kayaks as well as some simple fishing-rods for amateurs. If you're lucky, you may catch a big pike! If you like horse-back riding, we know where you should go. Charlotte Schröder is a popular guide in Gruvbyn. She arranges guided tours about Utö and the society it was when the mines were active, the life now and then at Utö and further out, about the poor people and the rich people, and how Utö became famous. She is also a teacher for all the children and adults who want to learn how to ride a horse. 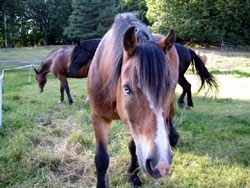 She teaches western riding and at the same time you can enjoy the beautiful surroundings of Utö. Make your reservation with Charlotte Schröder by telephone: +46(0)8 501 57 657 or +46 (0)70 200 37 64. Utö and the surrounding islands are unique from a geological point of view and attract many people all-year round. Holmqvistit is a kind of mineral that only can be found on Utö and the island of Madagaskar (close to Africa). You can see it and many other kinds of minerals and stones at Utö Gruvmuseum, open daily in summertime in the afternoons. At Näsudden there are some remnants from 1719 when the Russians were burning down almost everything in the archipelago from Finland to southern part of Sweden. When they were preparing food, the made a special kind of stove combined with oven, which can be seen at Näsudden and Rånö. 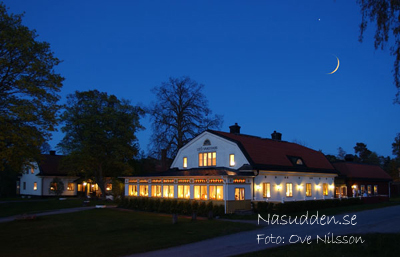 At Rånö you can find a minimarket and a small restaurant with entertainment in the summer. There is also a possibility to camp or rent a cottages on that island. 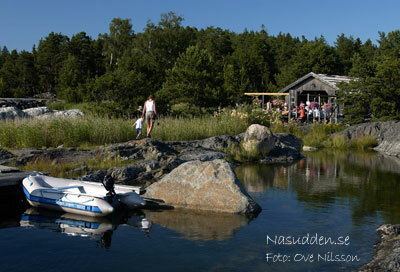 At Ålö there is a popular restaurant with entertainment during all of July. They have their own restaurant, Båtshaket, and serve their own fish, usually salmon and eel. From Ålö you can take the boat to Rånö and Nåttarö and also all the way to Nynäshamn. In Nynäshamn you have a commuter train to Stockholm. You can also take one of the big ships to Gotland and Gotska Sandön. From Näsudden, you can walk a couple of minutes to Lervik, which is a nice place for swimming especially for small children as there is a sandy beach there. For the bigger ones there are some cliffs. A few minutes more, takes you to Alléviken, which has two larger sandy beaches. If you walk the other way, passing Utö Kyrka (church) and the school, you will come to Hembygdsgården. It is open for public during some weeks in late July and beginning of August, and you can enjoy some refreshments together with homemade cookies. It also has an auction and swapmeet. They are responsible for the museum across Utö Värdshus. The interesting minerals and the exhibition of life on Utö are well worth the entrance of SEK 10 (ca 1 euro). At Utö Turistbyrå you can get some information about the Utöstigen. It is a 3 km walk-around with a map and some questions made by the students of the school. The informative signs make it fun and interesting for both young and old. 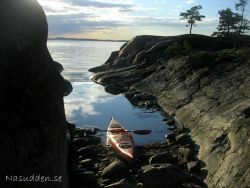 At Aktiv skärgård, you can rent small boats and kayaks. They also offer guided packages. A nice café with view of the incoming boats are to be enjoyed from the rooftop. In modern Sweden, Midsummer's Eve and Midsummer's Day (Midsommarafton and Midsommardagen) are celebrated from the eve of the Saturday between June 20 - 26. It is arguably the most important holiday of the year, and one of the most uniquely Swedish in the way it is celebrated, even if it has been influenced by other countries long ago. The main celebrations take place on the Friday, and the traditional events include raising and dancing around a huge maypole. One typical dance is the frog dance. Before the maypole is raised, greens and flowers are collected and used to cover the entire pole. Raising and dancing around a maypole (majstången or midsommarstången) is an activity that attracts families and many others. People dancing around the pole listen to traditional music and many wear traditional folk costumes. The year's first potatoes, pickled herring, sour cream, and possibly the first strawberries of the season are on the menu. Drinking songs are also important at this feast, and many drink heavily(!). To many Swedes this holiday is seen as a holiday of partying, and as the start of the summer. The cities become almost deserted as most people travel to the country, often to their summer cottages, to celebrate. The children on Utö enjoy a tour by a kind nice horse and her wagon, usually handled by her owner Monica. Together, they collect flowers in the morning to dress the midsummer pole. In the afternoon, at 2 PM, it is risen and the dancing begins. Afterwards, the childen have lemonade and some cinnamonrolls. The adults sometimes bring their own picnic, or take a little nap in the grass, after all that singing and dancing. It's something very traditional, unique and special to experience!